Celebrating the Start of our 30th Year! Today is a very special day! 29 years ago, on November 5th, 1985, Premier Designs was incorporated. It was a wonderful day; I remember it well! One that Joan and I had prayed about for a long time. It is absolutely amazing what God has done and is doing through this company dedicated to serving others and honoring Him. As we start our 30th year – WOW – I want to give you a BIG CONGRATULATIONS and thank each of you for being a part of the Premier Family. You are so special and have contributed to the success of Premier these 29 years. As in any venture, there have been ups and downs, heartaches and happiness. It hasn’t always been easy, but it has been most worthwhile. Even through the painful times, there has been an inner peace that can only come from God. One of the keys to our endurance is our total belief that God is in this business. We have relied on His Word and still do, seeking God’s will and direction. He gave Joan and me many verses of promise. These promises were written down and prayed about daily before founding Premier. These promises helped us to acquire a confidence that gave us hope, strength and assurance to carry on, and on, and on. I am amazed at what God is doing. Our basic establishments of Premier have not changed – our Philosophy, our Purpose, our Plan. We are built on the Biblical Principles of giving, loving and serving others. Premier is a company that is permeated with service. There is not another company on earth that has been blessed with people who care, share and who have the vision of Premier. There are still many, many people who need encouragement, who need to be reaffirmed of their worth, who need fellowship, who need financial security. Our Purpose to enrich every life we touch can never be fulfilled. Yes, Premier can be the answer! We must remember, it’s in the enriching of others that we, the Premier Family, are enriched. May I remind you that the road to future success is called SERVICE. In building Premier, we must stay on this road to fulfill its purpose and bless all who are involved. Pray for us as we seek God’s wisdom and direction, and we will give God the glory as the miracles continue. We are thankful for the past, rejoicing in the present and hopeful for the future. Happy Anniversary Premier Designs! So glad that Andy and Joan followed their hearts so they could change mine. The past 24 years have been an honor and privilege and I’m looking forward to the journey ahead. Counting it all Joy! Happy Anniversary Premier Designs. Thank you so much for following God’s direction and all the sacrifices you made so that so many of us could have a business that provides for our family and so much more. My heart is full of gratitude this morning! Happy Anniversary Premier Designs! 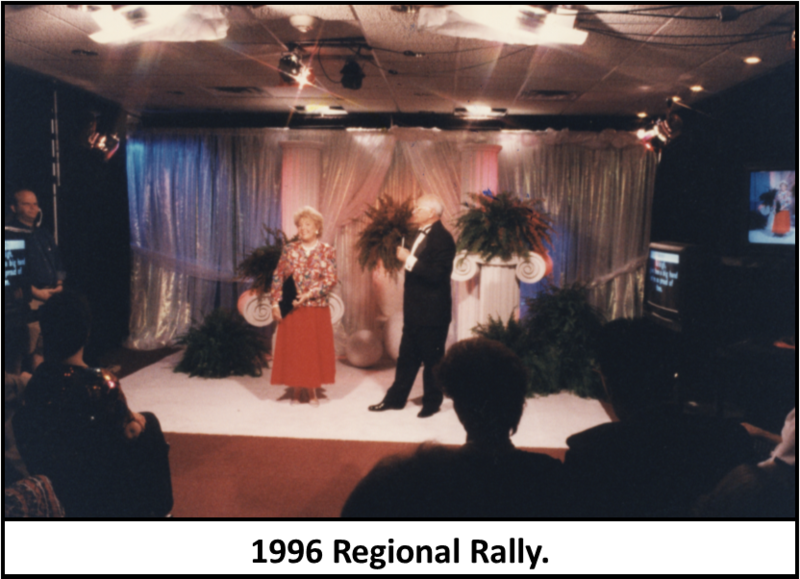 So thankful that the Lord led Don and me to Premier Designs 21 years ago! Our lives have been enriched by the friendship, leadership & example of love, service and caring by Joan & Andy! It’s been a joy serving the Lord through Premier and we pray God’s hand of blessing continues in the years ahead under the leadership of Tim & Peggy! Happy Anniversary Premier Designs! It has been a wonderful, challenging, life-changing opportunity. I am so thankful to have had the honor of being a part of Premier Designs since February of 1987.. God knew my love of fashion and the desire to honor Him in my life’s work. The answer came through the obedience and faithfulness of Andy and Joan. The impact of the Horner family has now been felt around the world.The continued success of the field has been the encouragement, faithfulness and example of Elizabeth and Randy Draper who have served almost the entire 30 years! Thank you Premier associates, leadership, jewelers, hostesses and customers who have impacted my life and made this momentous day a reality. I don’t know why every time Andy speaks I end up with tears in my eyes. Thank you and your family for all of your work, your endurance, your perseverance, your visions, your prayers and your service. Happy 30th. Thank You to Andy & Joan and all who have been such an asset in making this the BEST thing for all who become apart of this amazing family focused business!! We are better parents, spouses and people because of your faithfulness! We are so excited to be apart of this milestone and know there will be many more!!!! We are in good hands with Tim & Peggy as we look to the future!!! God certainly has blessed Premier Designs! As we have watched this company grow for 27 years we have been amazed over the lives changed and God glorified. We too count it all joy being a part of something so special and pray for continued blessings on our company. Heartfelt thanks to the entire Horner family for their love, care and sacrifices they have made thru the years serving the Lord and being an incredible example of integrity and service. TO GOD BE THE GLORY… Great things HE has done! I never would have thought that I would be doing anything like Premier and now I can’t imagine my life without Premier. I have SO MUCH appreciated being able to stay at home with my children and help with the income and bills at the same time. Now that my children are all grown and I am empty nest, I am looking forward to helping other women have the same opportunity!!! I am so proud to be part of a company that was founded on Biblical Principles and continues to be today – I can share my faith and my relationship with Christ and not be afraid. When caring for a patient one time (I am a nurse), I offered to pray with them and got reported. I can be open and share the hope that we can have in Christ without any hesitation. What a blessing. Andy, it is great to be part of your family in Premier. I pray for you and for the company daily and look forward to carrying on your dream and the hope that you had when you started – praise the Lord for your interest in others and continuing His work and in return, you have offered the same home to thousands of others. Happy Birthday, Premier and may the joy of serving God and others continue and be multiplied hundredfold!!! !